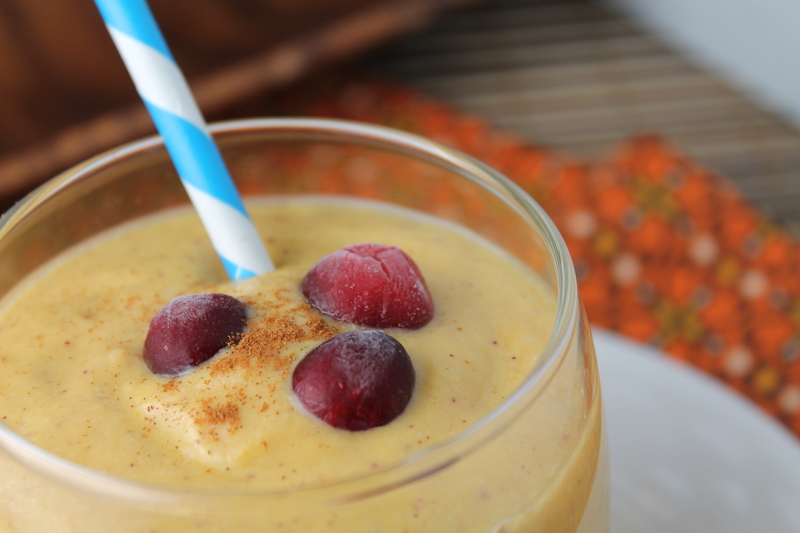 A luscious, creamy Paleo pumpkin smoothie to start your day off right! Loaded with healthy ingredients, this full meal will leave you satisfied for hours with a balance of healthy fats, fiber, and protein. 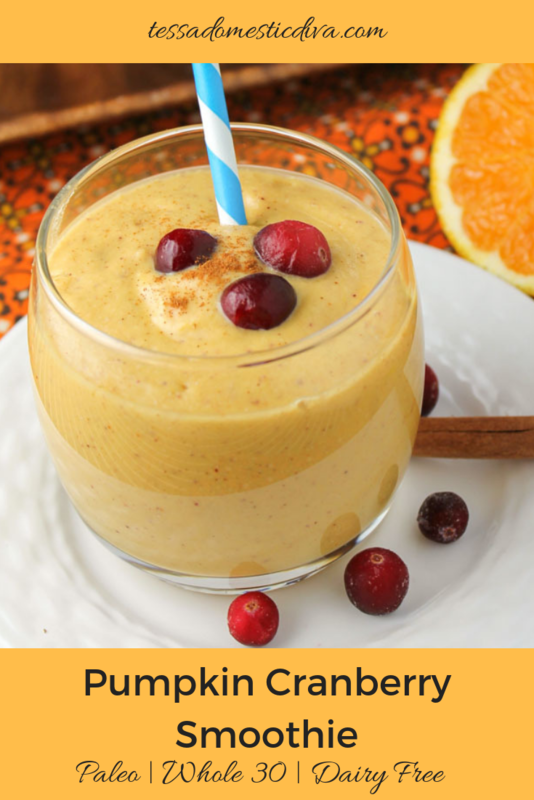 With fall in full swing and fresh pumpkin puree up the wazzu, I wanted to create a smoothie that highlighted some of my very favorite flavors from this season: pumpkin, apples, cranberries, and cinnamon. This tempting smoothie was a tinkering over many attempts. I wanted to be sure and include some healthy fats (coconut oil, nuts), as well as a bit of protein for a full-meal deal. For those who cannot do nuts, this smoothie is just as delicious without the cashews and were actually a last minute addition for me. Raw sunflower seeds are another good option. The sweetness is a total personal preference, so please add more or less sweetener as your taste buds dictate. We have also added banana to this smoothie and loved it. Smoothies are so flexible! Chia seeds would be another nutritious addition. Should I Use Fresh Pumpkin Puree? If you are new to my blog, or a repeat offender, let me reiterate: FRESH PUMPKIN PUREE IS BY FAR AND AWAY TASTIER THAN THE STUFF IN THE CAN!! It is so worth a little extra effort and is tasty enough to eat on it’s own! I have a tutorial on how to make your own fresh pumpkin, and it really is so easy! If you have some time, I have shared this recipe on And Love It Too’s Ingredient Challenge, pumpkin is this months theme! I have lots of additional pumpkin recipes, over 30 recipes that include it! Here are a few you could check out! A smoothie that wraps some of Fall's favorite flavors into one delicious and healthy cup. 5-10 drops stevia liquid to taste. Honey, maple syrup, or palm sugar could all be used instead. Depending on your fruit sweetness, this is unnecessary. Place all ingredients in a high powered blender and whir until smooth. If you do not have a high powered blender, use soaked cashews (raw cashews soaked in fresh water for a few hours minimum and drained), fresh squeezed orange juice instead of an orange, and applesauce instead of an apple. Add 10 grams protein if you use a scoop of collagen!! Congrats!! Your recipe is being featured on Gluten Free & DIY Tuesdays. Thank you for sharing this yummy smoothie recipe with us. Im not a fan of pumpkin but this looks great will be sure to make this. There are so many gorgeous cranberries around lately, I really, really wish I could get fresh cranberries here! I’m going to have to make this with raspberries (and maybe thrown some dried cranberries in the blender too). 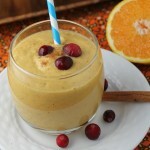 What an amazing recipe for a dairy-free Pumpkin Cranberry Smoothie. I can’t wait to try this. Glad I found your post on the Hearth and Soul blog hop! What a great smoothie for the season! Thank you so much for sharing with Full Plate Thursday and hope your weekend was great! Like fall in a glass!! Thanks for sharing on Tuesday Greens! This looks so awesome! Cranberries are my absolute favorite, it’s such a shame that most people only eat them on thanksgiving! I found you through Slightly Indulgent Tuesdays and this recipe looks fabulous! I have all of the ingredients and can’t wait to try it! Wow! I found this recipe on a search for a cranberry smoothie. I am enjoying the fruits of that labor as a write. 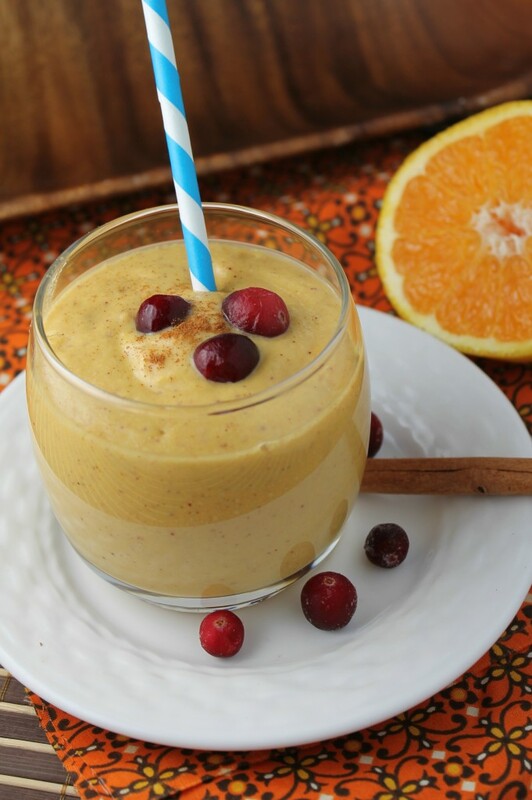 A very good and “autumn-ey” smoothie. I don’t have any allergies so I used 1/2 cup fat free cottage cheese and 1/4 cup kefir instead of the non dairy milk. I used two clementines insead of 1/2 of the orange. I added ~ 1/3 cup whey protein powder, 2T ground flax seed, a splash of vanilla extract. Very good! My kids loved it too! Thanks for sharing all your tweaks Karen, so happy you enjoyed it….it really is autumny! Awesome Casey, come back and let us know what you do and if it works out or not! I will try it again with macadamia nuts… but it IS great with cashews as you have it. Great recipe. I made this twice; used macadamia nuts the first time and cashews the second. Turned out better the second time! Thank you for letting me know Ivan!! Macadamia nuts would be an interesting tweak…noted! Thanks for sharing with Simple Meals Friday! This is one of our featured posts! This smoothie sounds delicious, and it’s so wonderfully seasonal! This looks tasty! I hope you will share it with Simple Meals Friday! I make one similar! Yum! Lol, every time I go to a link exchange and click on something that looks scrumptious, I find myself on your site! I’m going to have to try this!! Hi Danielle…I will take that as quite a compliment!! I would love your feedback on the smoothie! Ohlala…a must make smoothie! This drink and the ingredients are calling out my name. Tessa, This looks so good, I’d have it for dessert! I really need to do more with pumpkin puree…. Yes France, you NEED too, it is so darn delicious…go for the sugar pie to start, smallest’ easiest and sweetest! Thank you Sunny! 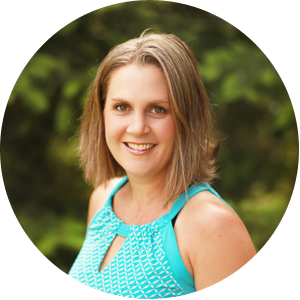 Can ‘t wait to hear your input….I would love to have some recipe testers! I just LOVE the look of this smoothie. So creamy and delicious. I love the fall inspired ingredients here! Just lovely. I’m voting for ya girl. You rock!!! Did you try it Minnie? Or just love the look of it? I am impressed if you already whipped it up! I LOVE smoothies!! 🙂 I got this tweeted and pinned!